I met my guardian angel today, she shot me in the face. It was the way they moved: casual and natural, like somebody sliding past you on an elevator. You don't even think to object when they brush against your junk; it's just a thing that happens, sometimes. "There's no way the club is this far," I finally said, breaking the silence. Wash was gone. Wash was gone... and there was still a hand on my shoulder. Think The World's End meets The Strain. Gloriously brutal and gore, darkly humorous and absolutely unputdownable. What a freaking wild ride! If you like sharp wit, fast-paced action, ominous and somewhat existential themes mixed with some seriously whacked-out scifi monsters, you will literally gobble this book down. I know I did!!! I didn't think much about this book when it first arrived at my doorstep. Well, I did think that the cover was pretty badass, but I haven't heard anything about the novel or the writer behind it, so I didn't know what to expect. I picked it up merely to read a couple passages and get an idea what it was about (at that time, there was only one vague Goodreads review and I thought the official book synopsis made this story sound heavy, convoluted and maybe even annoyingly surreal). I got sucked in immediately. The writing style (the awesome alternating points of view placed in two different timelines that blended together seamlessly towards the end of the book), the characters (probably two of my favorite characters EVER), the head-spinning action, the impressively complex and deliciously quirky plot line and, finally, the vividly painted backdrop of 1977 punk scene sent me into a reading frenzy. And it was one roller-freaking-coaster ride, people! 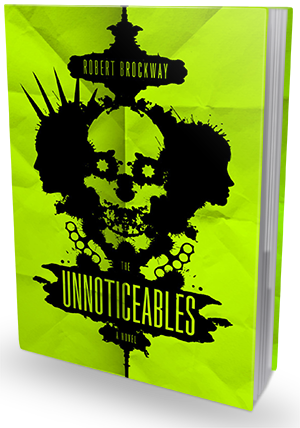 The Unnoticables is both madcap and ingenious. It's like the perfect blend of dark comedy and gut-twisting horror visuals that accomplishes what very few other books or movies manage to accomplish - it makes you laugh like a maniac while terrifying you to the core at the same time. There are many scenes in this book with this kind of dual effect on the reader, but the one I'm most in love with takes place in the sewer tunnels. There is so much intensity there, that when the characters do or say something funny, you literally choke out laughs that sound like very high-pitched whimpers. It's maddening, but also oddly addicting. I want more of that stuff, please. Undeniably, this probably isn't a book for the faint of heart. There are many scenes here that can twist your stomach into a knot and make you shudder with disgust (and we are talking people raped to bloody pulps, broken limbs, etc). The author does not fixate on those, nor does he elaborate on them unless it is necessary, but still, for many readers it will still be too much. I didn't mind *shrugs*. Maybe that calls in question my own mental stability, but I actually enjoy horror (even gore horror) done right, and this one here is one of the finest ones I've ever read. In my opinion, The Unnoticables is simply phenomenal. An astonishing genre mash-up that is both heartfelt and entertaining. Sporting a charismatic cast of characters and unique atmosphere of hilarious dread, it deftly avoids the typical horror book cliches in favor of more savory mix of supernatural thrills and B-class gore. I can't rave about it enough. If you enjoy a good scare and an even better belly-laugh, you simply must read it.